Music for Everyone classes offer musical activities that are playful, interactive and educational. 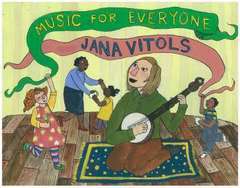 Using songs, storybooks, puppets, games, percussion instruments and folk dances, early childhood music teacher Jana Vitols disguises music education in a costume of play. She shares her enthusiasm for music, accompanying classes on violin, banjo and guitar. 2-5 year olds and their parent/caregiver are welcome to join the upcoming music series that starts, Wednesday March 27 @ The Lakewood/Seward Park Community Club! Wed & Th 10 & 11am classes currently have a few openings. Children engage in imaginative musical activities, develop rhythmic, melodic and improvisational skills and are introduced to musical concepts such as pitch, meter, tempo, and dynamics. Music for Everyone classes are a joyful way for children to grasp the primary concepts inherent in music while discovering their own unique musical expression.